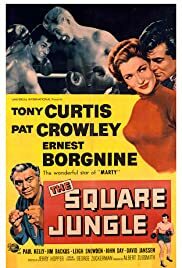 The Square Jungle finds Tony Curtis as an eager young man with limited prospects and an alcoholic father on his hands in the person of Jim Backus on his hand. A fact brutally pointed out by Clancy Cooper who is the father of Pat Crowley whom Tony is going out with. With the help of a friendly police captain Paul Kelly, Tony decides to become a boxer and Kelly even gets him former fighter Ernest Borgnine to train him. Curtis is well cast in the part of the eager young middleweight who rises to the championship, but loses sight of some values along the way. That's Borgnine's other function besides training, but even he can't help Curtis when he starts casting eyes at curvaceous Leigh Snowden. The film has some elements of Champion, The Crowd Roars, Kid Galahad and a few other boxing films. It's all a good mix for Tony Curtis who was in his salad days when he was making this for Universal Pictures. In his memoirs he had nothing to say about this film, but I recall him on a television series where he spoke on the long past scandal of Paul Kelly committing a homicide in which he did some time. He said that Kelly was a first class gentleman and very helpful and gracious to a young actor on the way up. In his memoirs he did mention however David Janssen who plays a sports writer here and who was also part of Universal's stable of contract players then, that Janssen was convinced that he was the illegitimate son of Clark Gable. Looking at their ears I could see why he would think that. The Square Jungle was definitely a boost for the career of Tony Curtis.